Arion Original Puppy Small Chicken & Rice is a feed with high protein levels, led to puppies dog breeds small (1-10 kg at adult age). 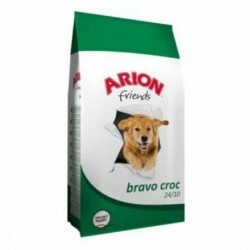 Arion Original Puppy Small Chicken & Rice is a I think gluten-free led to puppies of small breeds and that they need to comply with all the requirements of nutrition and growth. The formula of Arion Original Small Chicken & Rice contains high levels of protein of the first quality, to promote the development of the animal . Chicken (dehydrated, 43%), rice (32%), animal fat, hydrolysed animal protein, peas, brewers yeast, potato, beet pulp, fish oil, salt, refined cellulose, calcium carbonate, FOS, MOS, grape seed, citrus. DHA 0,1, phosphorus 0,9, calcium 1,4, crude Fiber 2, crude Ash 6,5, crude Fat 18, Protein, gross 28, E8 Selenium 0,3, E2 iodine 4, E5 manganese-10, E4 copper 18, E1 iron 140, E6 zinc 200, vitamin D3 (IE) 1900, Vitamin A (IE) 22000. Description: Arion Original Puppies Small Breed Chicken and Rice Arion Original Puppy Small Chicken & Rice is a feed with high protein levels , led to puppies dog breeds small (1-10 kg at adult age).